This simple crockpot tomato sauce takes little effort. It is easy to fill the crockpot up with fresh tomatoes, onions, and garlic and let it simmer all day. This crockpot tomato sauce is something that I rely on often during the peak of the tomato harvest. While the majority of the tomatoes from the garden are preserved in large batches for winter food storage. The crockpot is perfect for making smaller batch for fresh eating. It takes little effort to fill the crockpot up with all the ingredients and let it simmer all day. You can even break up the process over a few days if you are crunched for time by cooling and refrigerating the sauce part way through and start cooking again the next day. Select meaty, plumb or paste tomatoes for a thick and flavorful sauce. My favorites are Roma, San Marzano, Amish Paste, and Juliet. Paste tomatoes have very little water content. You can still use other types of tomatoes, but it will take longer for the sauce to thicken. Cooking the tomatoes with the skins and seeds helps to thicken the sauce with the fruit’s natural pectin. Run the cooked sauce through a food strainer to remove seeds and skins. After the sauce has simmered for a while and the ingredients have softened, run though a through a food strainer or food mill to remove skins, seeds, and to smooth out the sauce. If you don’t mind the seeds and skins, you can use an immersion hand blender to smooth out your sauce. Using fresh herbs: I like using fresh herbs because they are readily available from the garden during the summer, but dried herbs are better for slow cooking because the flavor doesn’t diminish from cooking. If you are using fresh herbs, add extra at the end of the cooking time. 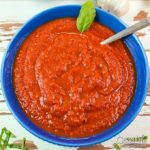 This homemade crockpot tomato sauce pairs perfectly with Ricotta Gnocchi, Homemade Egg Noodles, Zucchini Lasagna, spiralized veggies, spaghetti squash, and as a pizza topping. Since you are not canning this tomato sauce, feel free to add other ingredients such as precooked mushrooms, green peppers, sausage, or meatballs. Prepare your tomatoes by washing in plain water. Cut them in half or quarters and add to the crockpot. Add the garlic, onion, carrot, and herbs. Drizzle the wine and olive oil. Cover and turn crockpot to low and cook for 2-4 hours stirring occasionally. 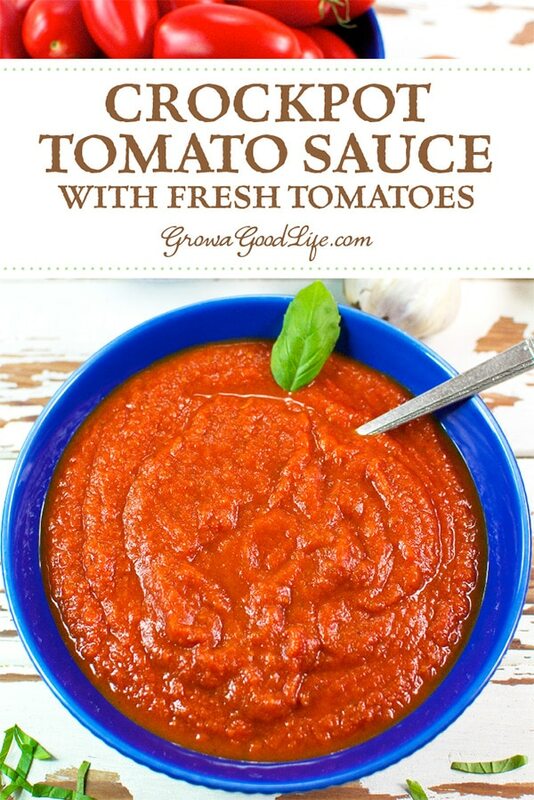 After the sauce has simmered for a while and tomatoes have released their juices and the vegetables are soft, turn off crockpot and allow the sauce to cool. 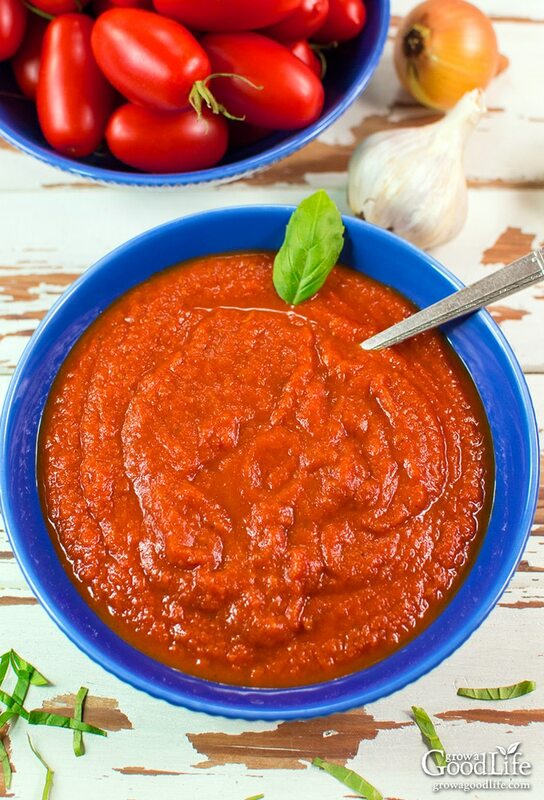 Run the cooled tomato sauce through a Food Strainer or Food Mill to remove skins, seeds, and to smooth out the sauce. If you are crunched for time, you can pop the cooled sauce into the refrigerator and begin again the following day. Return the strained tomato sauce to the crockpot to cook down further to thicken the sauce. Turn the crockpot to low and vent the cover so excess moisture evaporates. Cook until your desired thickness, 4-6 hours or longer, stirring occasionally. Once the tomato sauce is nice and thick, taste it. Add salt and pepper and stir to mix in. Taste again. Adjust seasoning if needed. If the flavor is sharp and acidic, add a little honey and taste again. If you are including additional ingredients such as mushrooms, green peppers, sausage, or meatballs, precook these and add to the crockpot and cook on low for an additional 1-2 hours. Depending on the water content of your tomatoes and how long you cook down the tomato sauce, this will yield around 4 cups. Store extra in the fridge for leftovers for 2-3 days or freeze for a later meal. What a great recipe! This is great for my super bowl Sunday meatballs and gravy. I’m excited to add the meatballs I made earlier this week. I’ve also added a few anchovies and capers! Lovely recipe! Also saving this one in my family recipe book. Thank you for sharing! What is the difference between a crockpot and a slow cooker ? No difference. Crockpot is a brand name that makes slow cookers. Some people call slow cookers crockpots. I am thinking of making Pizza sauce for this recipe. The only thing I’m going to add is tomato past when i put back into the slow cooker to thicken. I tasted it after I put it in the food processor, and it taste like a good homemade pizza sauce. I am in love with this recipe. My sauce turned out delicious. Thank you for posting. This will go in our family cookbook I am making for my grandkids. I really liked this. In years past I had a hard time with my sauce being too watery. This did the trick and it thickened beautifully. I will make it again. I froze it for future use as my tomatoes are coming so fast and furious I can barely keep up. Zenovia, Thanks for commenting. I am so glad this worked for you. If I don’t have a food strainer / Mill, do I still stop cooking it, run it in the food processor, and continue cooking? Or should I just use the food processor at the end and not stop? Does it make any difference? Do you peel the tomatoes first? I don’t peel the tomatoes first, but you can if you like. 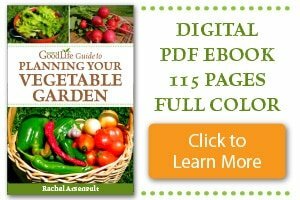 Can I use the crock pot method and then process them (using the proper lemon juice,salt, processing time) as with regular canning instructions? Michelle, This is not a safe canning recipe. You can freeze it, though. Can you skip the cooling step if using an emersion blender? What are “paste tomatos” please? Can you freeze this sauce for future use? The recipe sounded so good and seemed to have a lot of promise, but sad to say that we didn’t care for it at all. It was so flat and I had to add sugar (and a lot of it) to take away the bitterness. Maybe just my tomatoes, but the salsa I made from the same kind turned out wonderful so I’m confused as to why the failure. I started out exactly as written as the ingredients sounded so stellar that I didn’t want to change a thing. Pat, I am sorry the recipe didn’t work out for you. Usually if tomato sauce turns bitter, it was cooked too long or at a temperature that was too hot. I wonder if even on low, your slow cooker was too hot? Again, I am sorry this recipe was a disappointment. 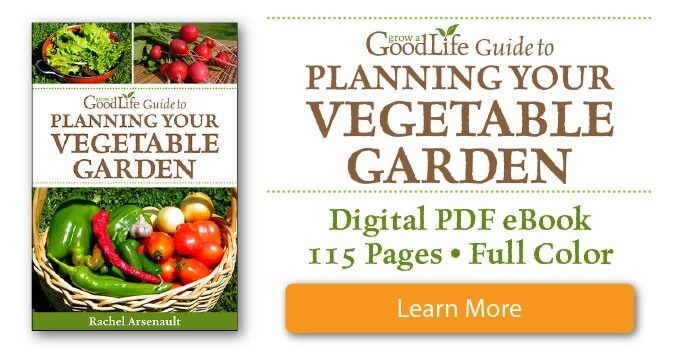 Sounds wonderful and I just picked a bushel of tomatoes (some of which) I will be giving this a try. Thank you so much for posting. I also have some tromboncina squash that I may be looking for a recipe for. Wow! This sounds so flavorful and hearty!